SAN DIEGO — As part of its stated continual effort to protect the environment and provide green alternatives for marina tenants, Sun Harbor Marina has installed two electric vehicle charging stations. Boat owners who drive electric cars will no longer have to worry about where to charge their vehicles, thanks to the new charging stations, said Kathy O’Brien, manager of Sun Harbor Marina. Located on the west end of the parking lot, the Blink DC Fast Charger system provides quick charging, with less heat generation and longer battery life than conventional chargers. Installation of the two Blink chargers no longer makes driving to the marina in electrically powered vehicles a challenge, O’Brien said. Tenants who have kept their electric vehicles at home in fear of running out of power can now drive their eco-friendly cars without any worry. “There aren’t that many electrical vehicle charging stations around,” O’Brien said. “If I had a tenant driving down from Escondido and I didn’t provide a charging station, they wouldn’t be able to realistically drive their car down and back. “This allows them to use their vehicle — because they can rest assured that there is a place to charge it, once they get here,” she said. Visitors to the area can also take advantage of the two newly installed chargers. 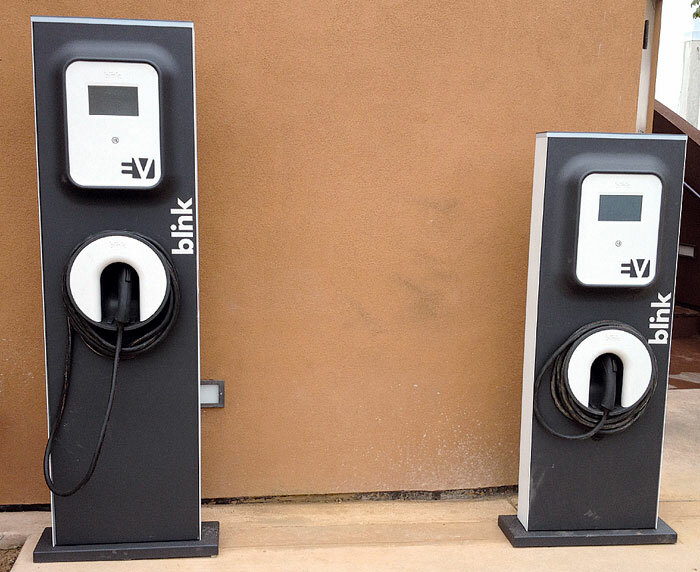 Blink’s Electric Vehicle Supply Equipment (EVSE) provides Level 2 charging (at 240v AC input) with user-friendly features. Chargers are operated by touch screens and are easy to use. The EVSE allows users to keep track of the charge status and statistics, and the easily programmable start/stop timing allows coordination with electric utility on/off peak time of use rates. Other charge stations are available at Spanish Landing, the Pearl Hotel and Shelter Island.